The Juki HZL-80HP Computerized Sewing and Quilting Machine is the perfect sewing and quilting companion. The Juki HZL-80HP is loaded with features and bears the Juki brand, so you can count on the highest quality in the industry for years of trouble free sewing. The Juki HZL-80HP weighs just 12 pounds - great for easy portability. The Juki HZL-80HP also adds an LCD display, so that you know exactly what is going on when sewing. LED display – The Juki HZL-80HP LED display lets you know what your current settings are, like stitch length, width and even what foot to use and more! Built-in font with memory – With the Juki HZL-80HP, you can use the memory for letters and patterns. Make names, sentences, and unique rows of stitching on your projects for a personalized touch. Built-in needle threader – The built in needle threader assists you in easily threading the needle for a fast start to your project. Start and stop button – Use your foot control or use the handy start and stop button. The color of this button indicates the machine status. Reverse stitch and reinforcing stitch - The Juki HZL-80HP can sew a locking stitch at the beginning and end of your stitch. The Juki HZL-80HP has two types of lock stitches, reverse and reinforcing stitches. Direct stitch pattern selection – This feature saves time. Just the push of a button brings you the most commonly used stitches. Needle up and down positioning – You don’t have to turn the hand wheel every time you want the needle up or down. Just a push of the button changes the position of the needle. You can even sew a half stitch. One-step buttonhole – 7 different one-step buttonholes. 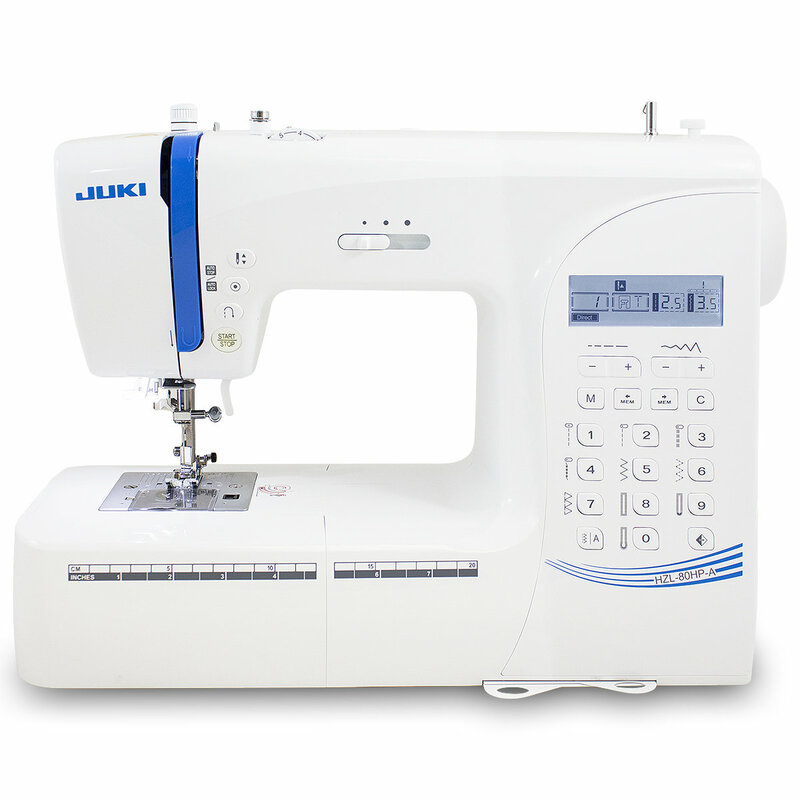 The Juki HZL-80HP will sew the buttonhole automatically according to the size of your button. Adjustable presser foot pressure – When sewing thin or thick material, adjust the pressure of the presser foot to allow for correct feeding of the fabric. Variable width and length adjustment - The Juki HZL-80HP allows you to change the width and length of your stitch, as well as changing needle positions. Quick reference guide – Just pull out the handy reference guides to view all of the stitch patterns.